This Period Study module covers option AC of the AQA 9-1 GCSE History topic "Russia, 1894–1945 - Tsardom and communism". 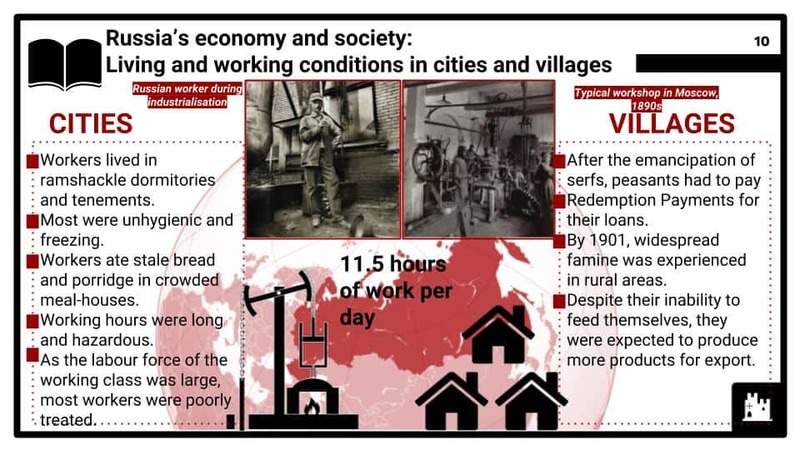 Russia’s economy and society: industrialisation; living and working conditions in cities and villages. Nicholas II’s autocracy and the court: the growth of revolutionary opposition; the 1905 Revolution and October Manifesto; the impact of, and reactions to, attempts to reform Russia up to 1914; the Dumas and political stalemate; Stolypin’s policies – land reform, industry and use of oppression. The First World War: the impact of military defeats on Tsarist government; social and economic effects of war on cities and the countryside; unpopularity of the Romanovs, including the role of Rasputin; the Tsar’s abdication. 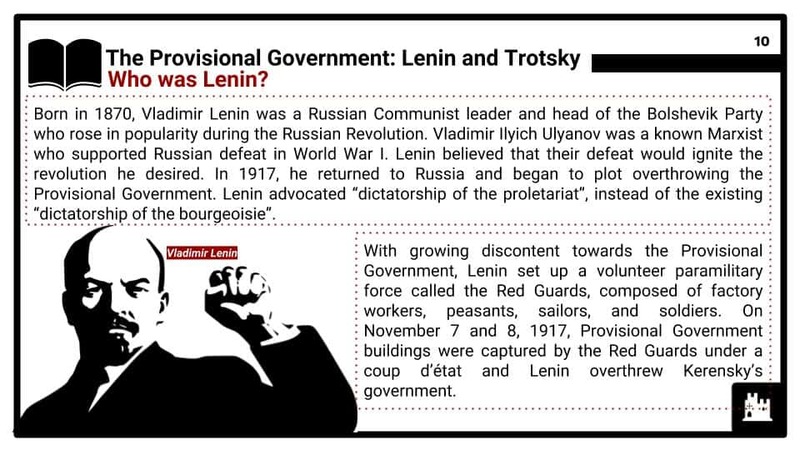 The impact of Lenin’s dictatorship: the end of the First World War; the Cheka; the Red Army; causes, nature and consequences of the Civil War and Bolshevik success; propaganda. Social and economic developments: War Communism; the Kronstadt Rising; the New Economic Policy (NEP); the achievements of Lenin and Trotsky. 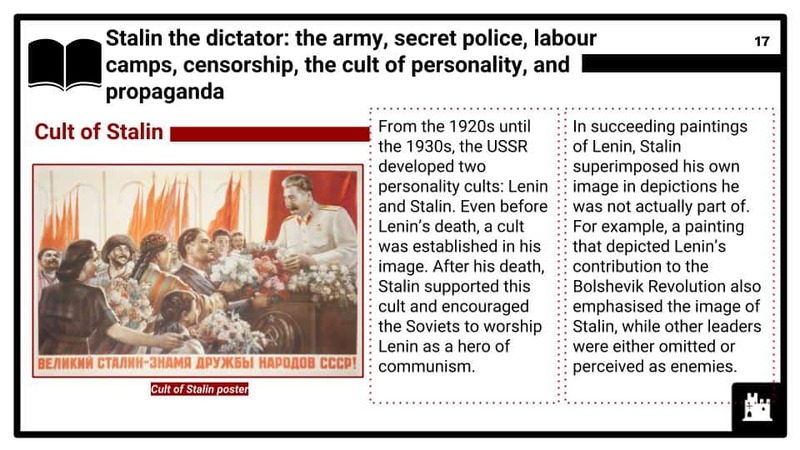 Stalin the dictator: the power struggle to succeed Lenin; the control of the Communist party over the government; the Terror and the Purges; the army; secret police; labour camps; censorship; the cult of personality; propaganda. Stalin’s modernisation of the USSR: collectivisation; the Five Year Plans; social and economic consequences for Kulaks, city dwellers, women, professional and industrial workers; the extent of modernisation. 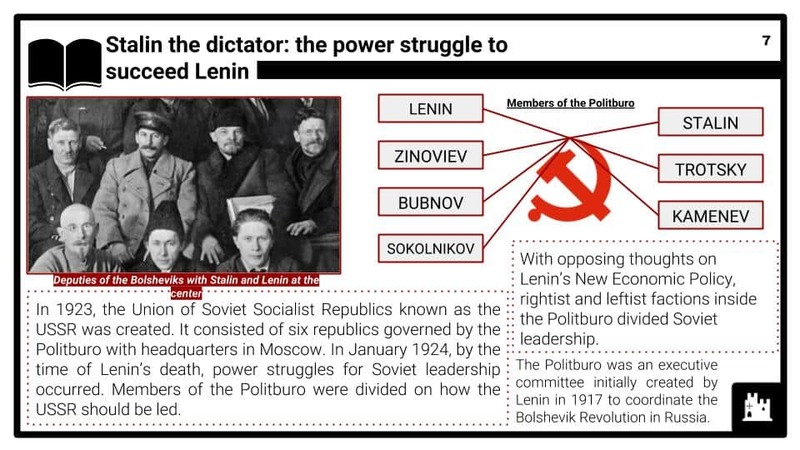 Impact of the Second World War: Stalin’s wartime leadership; political, economic and social problems caused by the Great Patriotic War up to 1945.